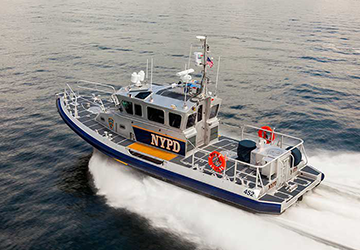 The newest response boat commissioned for the New York Police Department is the first for the organization that will be powered by Volvo Penta diesel inboard engines from Pacific Power Group. The fifth Response Boat – Medium C (RB-M C) built by Oregon’s Vigor Industrial will join the fleet of RB-M Cs currently providing maritime security and law enforcement in the New York metro area. The vessel, which is under construction at Vigor Ballard (formerly Kvichak Marine), is built based on a proven all-aluminum design utilized on more than 174 Coast Guard response boats and has been tested on countless missions. The NYPD has relied on these response boats for many different types of incidents. When the tragic incident of US Airways Flight 1549 occurred, crashing into the Hudson River minutes after liftoff in 2009, NYPD’s RB-M C were on the scene rescuing passengers and crew. The upcoming fifth vessel will expand their ability to respond on water. A Volvo Penta D13-800 inboard diesel engine will power the newest RB-M C and provides 800 hp at 2300 rpm, making the vessel capable of top speeds over 40 knots. The EPA Tier 3-rated D13 engine provides greater low speed torque, which gives the RB-M C strong acceleration, critical for tactical handling and specialized mission capabilities. Twin turbochargers and charge air coolers manage combustion temperature control and add to the engine’s durability. Also a first for the NYPD, the new vessel will feature Volvo Penta Electronic Vessel Controls (EVC), which allow for greater monitoring of engine data, fuel consumption, and other parameters to minimize downtime. Additionally, the new RB-M C will feature Rolls Royce FF385S waterjets and marine transmission from Pacific Power Group. “We’re proud to utilize our propulsion system expertise to develop a complete custom solution for the NYPD. The combination of the Volvo Penta D13 engines and Rolls Royce waterjets provides the newest response boat with superior maneuverability and the performance they need for their demanding missions,” said Vice President of Pacific Power Group, Bill Mossey. This is the fifth NYPD RB-M C build by Vigor that has been powered by Pacific Power Group. The new RB-M C is scheduled to be delivered in November 2017. Pacific Power Group has worked with marine defense projects for decades, pooling our expertise to provide power systems for Naval, coast guard, law enforcement, and other government agencies both worldwide and in the Pacific Northwest. Volvo Penta gensets are recommended and used by a wide variety of marine operations and businesses all over the world due to their high efficiency and exceptional reliability, easy service and installation, high serviceability, and low emission levels.